Bain de Terre is the brand of choice among stylists and salon Professionals all over the world. Take a look at the Bain de Terre mentions below! 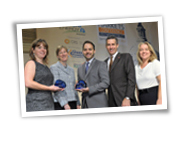 Zotos International wins EPA Green Power Leadership Award. Zotos International, Inc. (Zotos) today was awarded with a 2012 Green Power Leadership Award from the U.S. Environmental Protection Agency (EPA), honoring the company for its 3.3 MW on-­‐site wind generation project. Read more about the Zotos EPA Green Power Leadership Award. Bain de Terre reviewed at mystylebell.com "I Love Bain de Terre!" Bain de Terre reviewed at ommorphiabeautybar.com "Thumbs up for Bain de Terre keratin phyto-protein Strengthening Shampoo and Conditioner! Bain de Terre featured on getstunning.com "Hydrate your hair with Bain de Terre coconut papaya Ultra Hydrating Shampoo." Bain de Terre appears on modersalon.com "Bain de Terre Launches New Stylers!" Bain de Terre all day straight featured on Hollywoodlife.com "Get Jennifer Lopez Super Side Swept Bangs! Celebrity Stylist Chris Brescia Gives Us The How-To Steps!" Bain de Terre ’s day lily volumizing root lifter on beautyconnexion.com click here to view the article. Bain de Terre ’s jasmine 2-minute intense conditioner on MISSADVENTURES WITH MAYA click here to view the article. Bain de Terre ’s coconut papaya on the Real Style Network click here to view the article. * You will need the Adobe PDF reader in order to view this file. Don't have the reader? Download it here. On set with "30 Rock"